Partially freeze meat for 2-4 hours, until mostly solid. Slice meat into about 1/8” thickness strips (I use a meat slicer, but you can also do so with a really sharp nice); cut against the grain of the meat. Transfer sliced meat to a large container (I use plastic shoe boxes). Mix the apple juice and spices in a large measuring cup or bowl and pour over meat, to marinate. Put a lid on the container(s) and transfer to the refrigerator. Allow meat to marinate overnight. Preheat oven to 165F. I have a convection oven and set it on “Pure Convection”; if you have this setting, use it or follow the directions on your food dehydrator. If using an oven, set up racks (used for cooling cookies and cakes) over cookie sheets lined with aluminum foil (for easier cleanup). Lay strips of beef out on racks and transfer to the oven. Cook at 165F for about 3 hours***, with the door slightly ajar (I use a folded towel to keep the door propped open); cooking time will depend on the thickness and size of your meat slices. 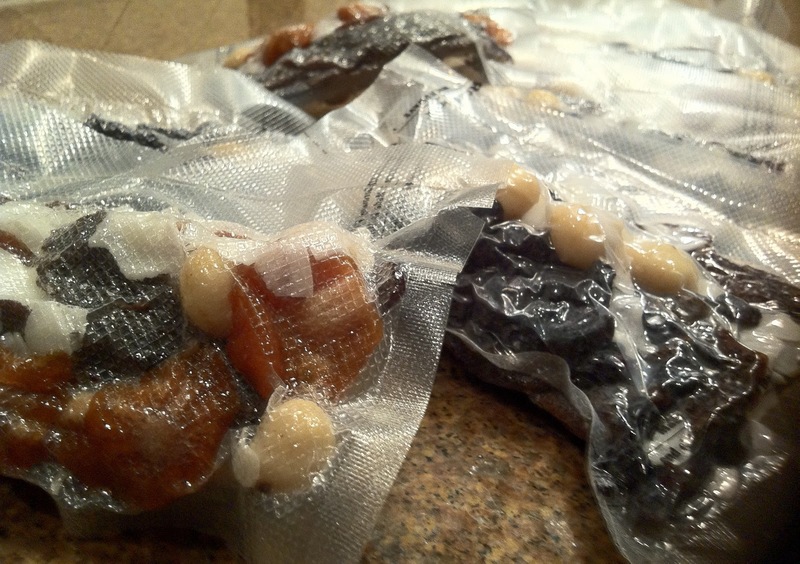 Once jerky is to your desired texture, it can be transferred to a tupperware container to retain moisture. If you plan to keep it around longer than a few days, package in airtight packaging (I use FoodSaver bags). *I found them at Whole Foods and Williams-Sonoma, but also check online. **I experimented with this spice mix, after my friend Jen sent it to me...it adds great flavor! This jerky is also really flavorful without it, but tastes even better with it. **As the meat dehydrates, it is losing it’s moisture, so watch to make sure that it doesn’t dry out too much. This sounds really good! I'm in the market for a meat slicer, but reading bad reviews about so many of them. Are you happy with yours? This one is really easy to disassemble, clean, and reassemble and doesn't have any spots where raw meat can get stuck. You have to unscrew the blade to remove, which is a minimal annoyance, but not really that big of a deal. It cuts through meat without too much effort, but a little more horsepower (do slicers have horsepower?) would be nice. This is the only meat slicer I've ever owned, but for the price I am totally happy. I think this is the perfect slicer for at-home use (i.e. slicing cooked roasts for lunch meat, semi-frozen meat for jerky, or even fruits and veggies for cooking or snacking). Can you link the meat slicer that you have? Thanks! Hey Stephanie! I did link it, it may just not show up in a different color on your computer (on mine it's orange)...try rolling over the words "meat slicer". Have you tried making jerky with any other meats? Just curious if chicken or turkey would be treated the same way. Michelle~ I've never used turkey or chicken, just beef and buffalo. Sorry I couldn't help out with this one...I'm really not sure how that would turn out. Hi Jen - The meat slicer looks great. Do you use the serrated blade that comes with it or did you buy a different one? Just the blade that comes with it. It works best if the meat is almost frozen through. I set this particular slicer to the 3rd line, for slicing my jerky. First beef my picky/food-intolerant toddler has eaten in MONTHS! THANK YOU!! What a hit! I'm going to try it with turkey...I'll report back as I saw someone else had the same ?. Can you post the Meat Slicer MAnufacturer and model. The link is not working on my computer. Thanks! The picture itself tells the story. This recipe looks great and quite tempting. Would like to see more posts from you. I have never made beef jerky before - have always been put off by finding the 'enzymes' and other ingredients that look too hard. Used your recipe and made my first batch last night. It worked really well! I also found out that my oven works brilliantly as a dehydrator - have never tried it out before. Thanks so much!! Besides, if you are facing any difficulty in finding the correct snack food then you can opt for the organic trail mix. This mixture of organic ingredients can be enjoyed as a healthy and flavorful snack. The key ingredients of the mixture make it an ideal choice for consumption. The snack is a unique one and is apart from others in every aspect.